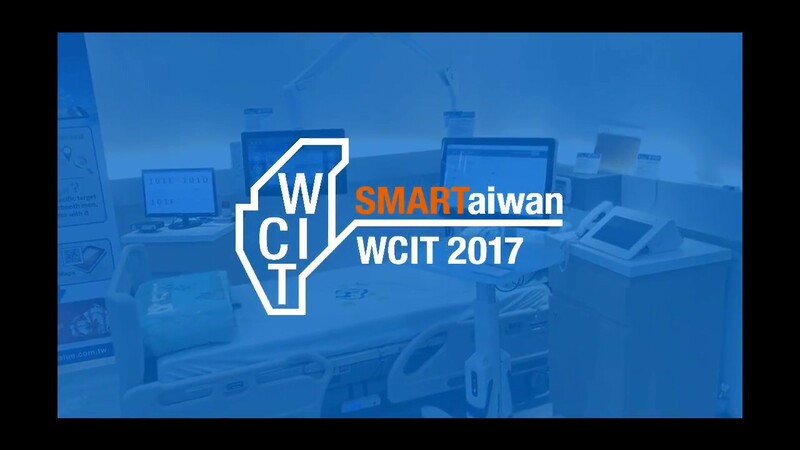 TAIPEI, TAIWAN, June 4th, 2012 – Avalue Technology Inc. （TAIEX: 3479-TW）, an Associate member of the Intel® Intelligent System Alliance, is unveiling new products, powered by the 3rd generation Intel® Core™ i5/i7 processors and the Mobile Intel® QM77 Express chipset. Compared to the previous generation Intel® Core™ processor family, the new platform delivers up to 15％ more CPU performance, up to 50％ more 3D Graphics performance and up to 1.8x HD to HD transcode speed. 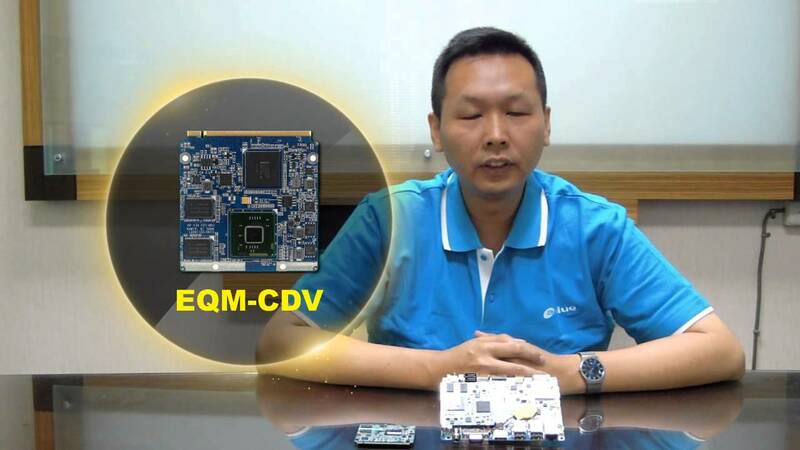 The 3.5-inch embedded board, ECM-QM77, supports one 204-pin DDR3 SODIMM system memory with up to 8GB DDR3 1333/1600 SDRAM capacity. ECM-QM77 supports dual channel 18/24-bit LVDS and triple display configurations. The rich I/O deployment includes 2 SATA III, 2 COM, 4 USB 3.0, 2 USB 2.0 and 8-bit DIO, enabling a variety of embedded applications. One audio jack supports Realtek ALC892, 7.1-CH audio. One Intel® 82574L GbE controller, one Intel® 82579 GbE PHY and one expansion slot of mini PCIe card are included. TPM1.2 and Intel® Active Management Technology 8.0 are also supported. The EPIC Module board, EPI-QM77, supports one 204-pin DDR3 SODIMM system memory with up to 8GB DDR3 1333/1600 SDRAM capacity. EPI-QM77 supports dual channel 18/24-bit LVDS and triple display configurations. The rich I/O deployment includes 2 SATA III, 2 COM, 4 USB 3.0, 2 USB 2.0 and 8-bit DIO, which meets the various requirements of embedded applications. One audio jack supports Realtek ALC892, 7.1-CH audio. One Intel® 82574L GbE controller, one Intel® 82579 GbE PHY and one expansion slot of mini PCIe card are included. The COM Express Type 6 Module, ESM-QM77, supports one 204-pin DDR3 SODIMM system memory with up to 8GB DDR3 1333/1600 SDRAM capacity. 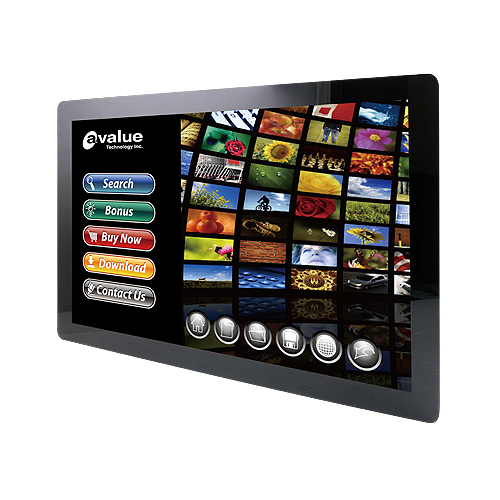 Dual channel 18/24-bit LVDS and triple display configurations are supported. The rich I/O deployment includes 4 SATA, 4 USB 3.0, 8 USB 2.0 and 4-bit DIO. One Intel® High Definition Audio, one Intel® 82579LM GbE, one expansion slot of PCIex16 and seven expansion slot of PCIex1 are included. 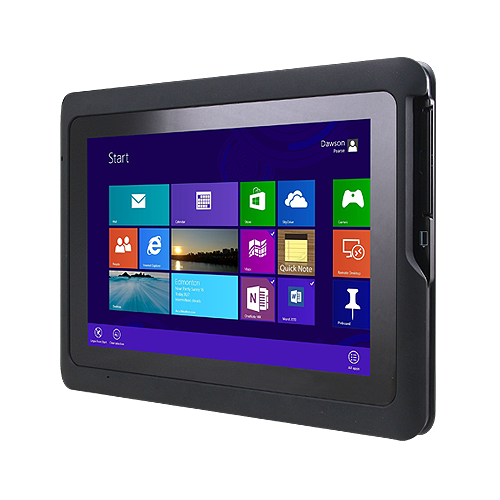 Intel® 3rd generation products also enable data security, system responsiveness and manageability. 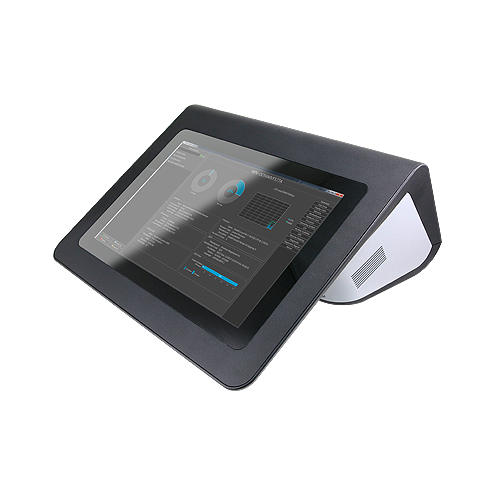 This platform is the ideal solution for various applications such as Digital signage, High-end Set-top box, High-end KIOSK, Medical and Gaming. 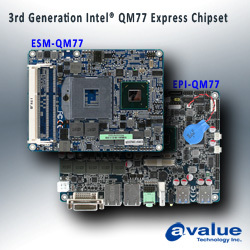 More information about Avalue products based on the Mobile Intel® QM77 Express chipset, please visit Avalue website at www.avalue.com.tw or contact with sales@avalue.com.tw for more details. Avalue Technology （TAIEX: 3479-TW） is a professional industrial computer manufacturing company, which is dedicated to developing the x86 architecture products, including embedded computers, single board computers （SBC）, Systems-on-Modules/ ETX （SoM/ ETX）, industrial motherboards, all-purpose panel PCs, and barebone products, etc. Having expanded, Avalue offers its expertise on PCB/ Assembly/ BIOS version control and after-sales all type of services. An ISO 9001:2008 certified company; Avalue offers assurance to customers in every aspect of its business. With its headquarter located in Taiwan, Avalue has global subsidiary company, including offices in Shanghai, New Jersey, California,Tokyo, and Denmark. 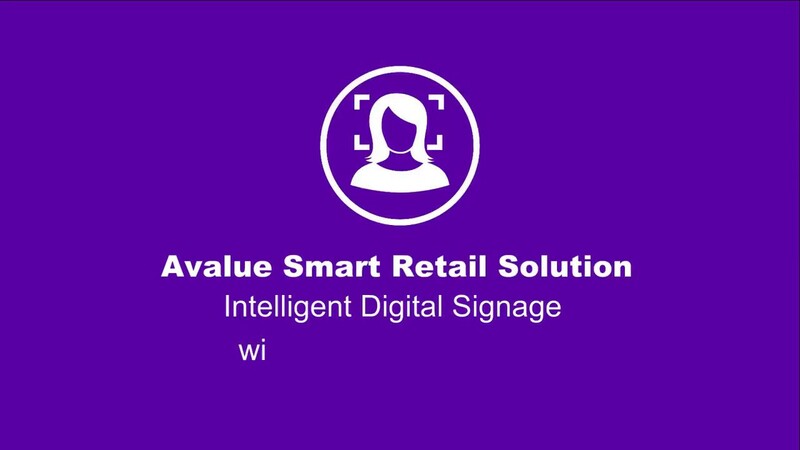 In addition, Avalue Technology operates an extensive distribution network to accommodate and serve customers all over the world.